Financial well-being is a tricky thing to measure, yet greatly affects people’s lives. CFPB created a survey and an online interactive tool that helps people understand their financial well-being. The 10 question survey allows consumers to rank themselves over a few measures. Part of making a score meaningful is adding context so that people know how to interpret it. CFPB surveyed and analyzed Americans’ scores to create a solid foundation of data about their average financial well-being, as well as which characteristics or lifestyle factors correlate with higher or lower scores. One drawback of this 92 point scoring system is that people tend to think it's like a school grading system, where a 60 would be a C- and not a great score. However, a 60 would be significantly higher than average. We tried several visualization methods like histograms and iterated after testing with users, who found most visuals too complex to understand. We ended up with a simple color bar and two markers. 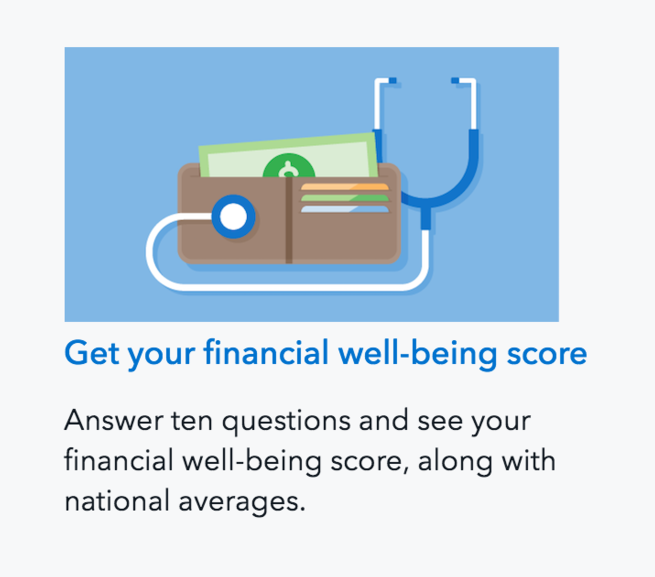 To give users more context about their score, we displayed data for age, household income and employment status along with the average financial well-being score. A simple line marker that pulls in color from the bar ended up being the most effective way to visualize this comparison. I brainstormed and collaborated with my colleagues at the bureau to create a cohesive set of feature images for the project that were displayed across the website and social media to bring attention to the survey and data. I collaborated and art directed better graphics for the full report to give users a brief overview of the scores and a quick look at overall trends for each section of characteristics.